WASHINGTON, Feb 8 (LETA) - On Thursday in Washington DC, Latvian Foreign Minister Edgars Rinkevics, together with the Ministers of Foreign Affairs of Lithuanian and Estonia, met with members of the United States Senate Committee on Foreign Relations for a discussion on cooperation between the Baltic States and the US, transatlantic relations, including security cooperation with the US, cooperation on cyber security, and working jointly towards security and defense in the European Union (EU), LETA was informed by the Foreign Ministry. The Latvian foreign minister drew the attention of the Chairman of the US Senate Foreign Relations Committee, Senator Jim Risch, and the Ranking Member of the Committee, Senator Bon Mendez, to the Baltic States as the staunchest advocates of a close transatlantic bond, the transatlantic unity being indispensable for European and global security. The unity between the EU and the US in countering Russia’s aggression has been a prime example of transatlantic cooperation. “Strong strategic partnership with the US is an indispensable element of Latvia’s security policy. We highly appreciate current US support for our defense. Enhancing security will also remain one of the priorities for the new government in Latvia, and we will continue to invest 2% of GDP in defense and improve our defense capabilities. An increased national defense spending is also leading to an even better host nation support,” said the minister. Rinkevics expressed the view that Russia continued to constitute a significant threat to Allied security, shared values and international rules-based order. Therefore, a strong and united Alliance remains the key stabilizing factor in the Euro-Atlantic space. Decisions taken at the recent NATO Summits have strengthened the Alliance’s deterrence and defense capabilities. Latvia supports a fairer burden-sharing among the Allies, which is important for both the Alliance’s capabilities and its political unity. In the context of EU security and defense cooperation, the Minister said he was convinced that NATO remains the cornerstone of collective security in Europe, which should be complemented and strengthened by EU initiatives. Latvia’s security interests lie in maintaining a strong transatlantic bond and further ensuring the leading role of the US in European security. In a discussion with the Chairman of the US House of Representatives Baltic Caucus, Representative Adam Schiff, Rinkevics expressed support for the EU’s decisive action in countering disinformation, including the need for enhancing the quality of national media in the Baltic States, in particular, strengthening the work of independent Russian-language news outlets. “We highly appreciate the Baltic-U.S. cooperation on cyber security. By employing methods of hybrid threat, Russia attempts to challenge the rules-based international order. We are fully aware of those threats, and we have taken relevant steps to boost our resilience. 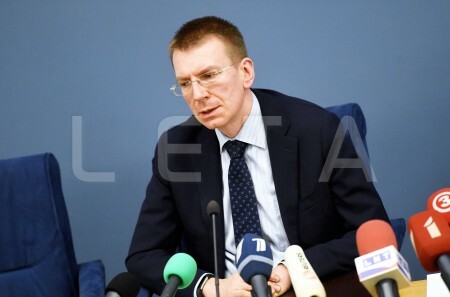 Besides national-scale measures, cooperation between the European Union and NATO, which includes sharing of information, coordinated exercises and other activities, is of utmost importance,” said Rinkevics.